Several months ago a neighbor in her mid-sixties lost her husband due to a heart attack. Even worse than dealing with the unexpected loss and heartbreak of losing her life partner, is her torment with stress and anxiety because of her debt and lack of resources. Unfortunately, she’s not alone. A recent article by CNN Money confirms that most Americans as are deeply worried about their financial future. According to CNN Money, “The Great Recession may be over, but a Great Insecurity seems to have emerged in its wake.” What’s going on here and what can we do? Perhaps a focus on simple living is the way to eliminate the anxiety and stress that so many feel today. On one level many of us are feeling better about the economy and the direction it is headed. CNN Money confirms that with their recent national survey. Over three-quarters of those surveyed felt that their money situation had stabilized or improved compared to a year ago. Also according to the survey, “Almost nine out of 10 expect that their finances will be the same or better 12 months from now.” This is a big improvement from their last survey in 2009. Also, according to CCN Money, many stock portfolios have recovered and many home and property prices are returning to pre-crash pricing. Unemployment levels are also gradually coming back down. But that’s where the good news seemed stuck. Of particular concern was long-term economic security. Specifically, six out of 10 were worried about retirement, family emergencies, and how to pay for health care. They also stressed about whether Social Security and Medicare will even be there when they need them. 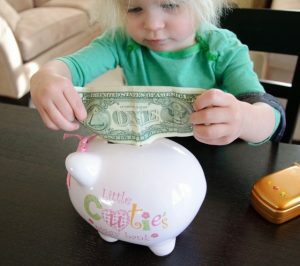 More than half admitted to living paycheck to paycheck with 60% saying they had no savings in case of emergencies. And it didn’t seem to matter what the age was of those concerned—everyone seemed anxious. Where’s The Anxiety Coming From? Not only is our financial system flawed, I also happen to believe that the media fuels fear in everyone by sensationalizing the news with the most dismal predictions possible. Instead of reporting the benefits of the new ACA (Affordable Care Act) and the many people who will now be covered, many media outlets (not to mention political parties) are doing their best to suggest that it will bankrupt our country. That kind of negativity and fear seeps into most people’s daily lives causing deep anxiety and concern. So How Can Simple Living Help? Before I go further let me assure you that when I say a return to simplicity will help, I’m not talking about joining a commune or living in a tent. A simple definition of simple living is: a lifestyle that minimizes consumption and maximizes those things that bring the most peace and joy. More freedom to create the life you desire, instead of feeling stuck in a job or a life just because you have no other choice. Allows you to appreciate what you do have instead of constantly craving what you don’t have. Provides you with a better work/life balance because you let go of pushing yourself to work longer and longer hours to maintain an over-consumptive lifestyle. In other words, Work SMARTer not harder! Help you clarify what is most important, meaningful and what really matters to you, and let go of the rest. Allows you to seek quality not quantity in all things. Helps you unclutter and let go of everything in your life that is messy, busy, overcomplicated and unnecessary. Introduces you to importance of all your true relationships—including a deeper connection to your community. Frees up your time to do the things you love and that makes you happy. Provides you with a deeper connection to nature by giving you the time to take walks, garden and appreciate being outdoors. In other words, spend time in nature. Slows you down and allow you to enjoy the moments of your every day. Leads you to become more self reliant and internally focused instead comparing yourself to others or using others to determine your worth. Guides you to making better health choices for yourself and your family. Provides freedom from maintaining or fussing about your possessions and instead spend that time doing things that make you smile. Offers you better and sounder sleep and times of rest. Gives you ease and agility when making life choices, decisions, exploring opportunities. Allows you to spend the rest of your life on a greener and healthier planet along with others (including your kids). 1) Simple living is not sacrificing and giving up the things you love. Quite the contrary, it is focusing on the things that bring you joy and meaning, and giving up all the superficial. 2) Simple living is not playing it safe and being uber careful. In fact, simple living might be the most courageous way possible to live, because you do it your way, not like anyone else. You give up what the world tells you is important, and only focus on those things that you know enhance your life. 3) And finally, simple living is not resigning yourself to a life that is less than what you have dreamed of, it is giving you the time, energy and focus to really live that dream instead of someone else’s. Simple living might not be for everyone in our country but for those who have the courage and desire, it will free you from anxiety and bring you both peace and happiness. My neighbor’s anxiety is far from over as she adjusts to her new life without her partner. 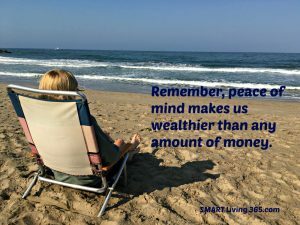 But eventually she, and every one of us can take steps to create a more simple life where we are not only free from financial anxiety, but where we are also free to live SMART 365. I just found your blog today and After reading these ideas I can say that these are really the best tips to reduce stress in life. Additionally, avoiding caffeine, nicotine and alcohol is highly recommended when managing anxiety. Exercise is also the perfect natural remedy to relieve anxiety and stress. Not only will you feel and look better, but it gets oxygen flowing to the brain and makes you happier. One of the funnest ways to relieve anxiety is simply to enjoy yourself. Stress originates with our own negative thoughts. It is important to be able to set those worries aside and think positively. The Simple movement has been around a long time, but this is one of the best summaries of helpful tips I’ve read. Thankyou! Thanks for sharing your wonderful tips! It’s really nice to see that more and more people are considering “alternative” ways to deal with anxiety and stress. I’m not against medicine and medication but I strongly believe that the key for managing anxiety, stress, panics etc. is in us and we should change our attitude. This is my favorite “Provides you with a deeper connection to nature by giving you the time to take walks, garden and appreciate being outdoors.” sometimes we realy forget to appreciate what we have and to enjoy nature and it’s vital as we are part of it. Really loved what you put together here Kathy, Its always better to take the natural approach in dealing with Anxiety like the 15 ways simply living can help. I try to teach natural remedies myself to others, so much more efficient to get to the core of the problem and face it head on instead of doing what most people do and use medications to mask the problem. you can check out my blog at Adults with Anxiety where I talk more about how individuals can overcome their anxiety with all natural remedies . Hi, Kathy. Nice to meet you. In our modern life, stress is a common issue that affect us physically and mentally. After reading the above article, i understood the steps to avoid stress are not easy, but simple. I’m a health conscious person, i want to share one simple step to avoid stress with all of you. There is a relationship between stress and exercise. When we exercise, our body releases chemicals called endorphins. These endorphins interact with the receptors in our brain that reduce our perception of pain. Regular exercise has proven to reduce stress, move away anxiety and feelings of depression, boost self esteem, improve sleep and so on. Am also a proponent of simple living … and love the quote in our image, especially. 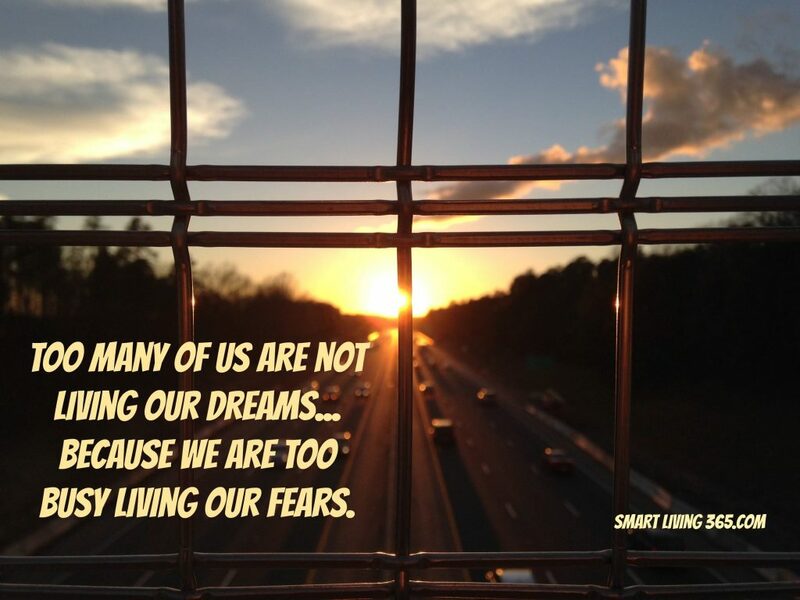 We ARE too busy living our fears. I really loved reading your article as it really contains many points that i really agree and seen in my life but now i am really very changed as i realized the magic of simple living life and i realized how complicated we take simple things we are habitual to complicated things and avoid simple thing. But i came out of it and now i believe and think the same way you have mentioned in the last three points. I think so many of us got caught up in the economy. Although our stories might be different than others we still have the same obstacles. We are doing fine as long as we both are alive. I can totally understand how your friend must have felt loosing her financial security. 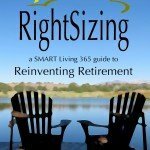 Many of us could not make it without both incomes, even being that it is SSI and retirements. I think my hubby would be fine without my contribution, but not me without his. For now we are living as simple as possible to recover from the economy and fix what we lost. At least the house values are starting to go back up. But optimism is always front and center for me. Can’t be worrying about something that has happened yet. Excellent summary on the ways that living simply can help to reduce stress and anxiety. Avoiding the 24/7 news and all the negativity that we’re bombarded with on a daily basis can go a long way as well. Thanks for sharing Kathy! Another great post to make my sunday morning merry. Indeed I have started living these days instead of just breathing and so in a way I am much more happy. My anxiety is losing momentum these days. Even if some of the items in your list are ‘old’ we all need reminders. And they’re so powerful when compiled like this. You mentioned fear of change, I’ve said in the past “I’m more comfortable in my discomfort”. Sometimes we get so used to the anxiety stress, marital discord -fill in the blank- that we wouldn’t imagine a way to change it. There is some comfort in knowledge as opposed to stepping out into the unknown. I chose to leave a job in 2009 and that decision required me to start simplifying. It was a wonderful discovery. Admittedly I’ve slipped a little so this is a nice nudge! This is my favorite: “Leads you to become more self reliant and internally focused instead comparing yourself to others or using others to determine your worth.” It’s so easy to live through others without even meaning to, whether by using them as a metric to see how we stack up (better? worse? keeping up?) or by relying on them to give us the affirmation we’re failing to give ourselves inside. Life really gets so much SIMPLER when you stop overthinking and constantly running all those mental calculations. Interesting, isn’t it, that though many ways to simplify materially do exist, one of the easiest is simply to clear up the clutter in our heads. I loved this post. 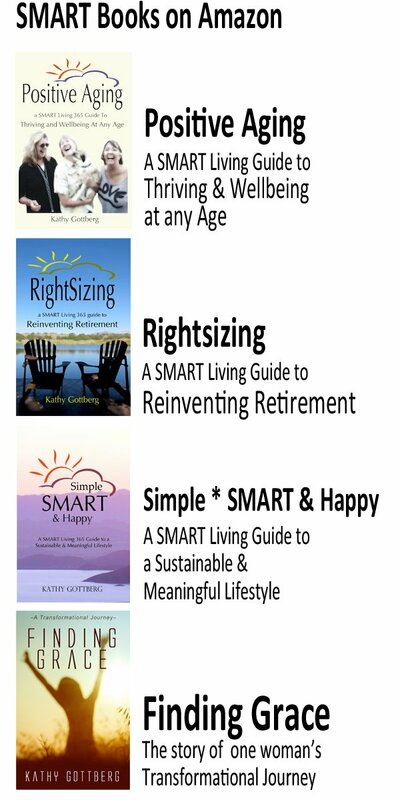 Hi Kathy and thank you for a wonderful post on the many, many benefits of living a simpler life!! I really liked the fact that you pointed out how “Simple living is not playing it safe and being uber careful”!! Ironically, living a simple life can be downright difficult at first and there is definitely a period of adjustment that might be hard on some people at first. But like anything worthwhile, patience, perseverance is the order of the day. In other words, simple living is worth the work! Thanks again Kathy for spreading the message and take care. My best to all. I’m so sorry to hear about your neighbor’s loss. I can only imagine how difficult a time this is. As always, your simple-living rules make perfect sense. I suspect that it’s not a skepticism that simple living isn’t what it’s cracked up to be that prevents people from making those lifestyle changes; rather a fear of change. Hi Nancy! Thanks Nancy. My neighbor is making progress so that is good news. But I found it such a great wake up call message that I couldn’t help but use it as a reminder for myself and anyone else who might be listening. I do suppose that fear of change might be keeping people from adopting a simpler lifestyle, but I think something far more problematic is that most people get into routines and follow the crowd far too easily. So instead of asking themselves, do I really need or want that new car, house, jewelry, etc. to be happy, they just go ahead and buy it. Then because they have to work harder at a job they may not even like to pay for it, they buy themselves more stuff because, “Gosh darn it, I deserve it!” And then keep on doing it day in and day out. I think honesty, clarity, awareness, and self reflection are far too often over looked in our culture and then we end up paying for it (NPI) in the long run. To me fear and anxiety are always worse when they are unknown or if I feel powerless against them. I think managing our debt and living simply erases the fear and empowers us. 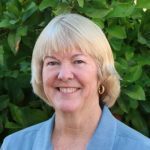 Thank you Kathy – it sounds so simple… 🙂 Another thing about simple living is when you are happy with where you are and what you have, you do not waste time trying to keep up with the neighbors. So what if they have a new car – along with that car likely comes new debt. If I learned anything during my working career it is that competition for recognition is a losing battle. Being happy with what you have gives you more time to just be happy. Stress and anxiety have always been part of our lives. I don’t think much has changed. But what has changed is the complexity of life. Simple living is the way to go for good health of all kinds. Thanks for the reminder! Stress and anxiety is a part of our lives. All of us have some kind of stress, but we need to know how to deal with it, which matters most. 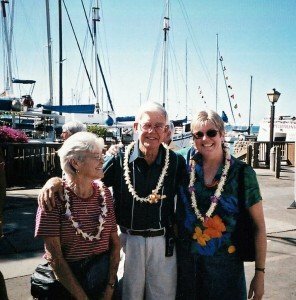 I can imagine the state of the person who loses their life partner, seeing my Dad live his life without my Mom – it’s certainly not easy. Those are amazing stats, but also a warning sign for people to pay attention before it starts affecting their health and lifestyle.